Circulus is an online accounts payable platform designed to accommodate the needs of small to medium companies that allows you to enter, approve and pay bills from your desktop or mobile device. The Circulus platform will auto-sync with your QuickBooks® online or desktop account, making sure your books are up-to-date. How long is the trial and what is included? Great news — your 30-day trial is free with no credit card required! The trial allows for 3 users, 15 complimentary ACH payments, 15 complimentary check payments and for complimentary data entry on 15 bills. Usage of any services does not roll over once the trial period has ended, so please make certain to time your complimentary services for bill payments within the 30 days. What will I need to sign-up and pay bills or expenses through Circulus? Will I need to install anything on my computer? No, you should not need to install anything; Circulus is an all-inclusive application. There are no license keys needed to install any type of software for Circulus. The only thing you may need to install if you do not have it already is QuickBooks Web Connector for QuickBooks Desktop integration. What browsers are compatible with Circulus? What support does Circulus offer? Am I being charged when I call customer service? No, customer support can be reached at a toll-free number at no cost to you. What are my subscription plan choices and how much does it cost? You have a choice between four subscription plans – just pick the one that best suits your needs. What is the Accountant Program, and how much does it cost? If you are an accountant or bookkeeper with your own firm, please contact us for more information here. How am I billed for my Circulus subscription? Each month you will be billed for that month’s subscription fee, as well as the previous month’s balance of ACH payments, check payments and data entry transaction fees. How does Circulus guarantee that my financial data is kept safe while online? All accounts have industry standard protection, SAS certification, and PCI certification; the same protections as online banking platforms. Our servers are firewall protected along with SSL for server-client communication. Plus, all sensitive information is encrypted. We are integrated with Authorize.net, BBVA Compass Bank, Norton, and many others in order to provide secure data hosting for our Customers. Our partnership with Norton Secure provides the leading standards of site security and data privacy, and our SSE16 certification demonstrates our commitment to the details of standards required by the accounting industry. Circulus is partnered with Rackspace to meet all our hosting performance needs and SSE16 compliance requirements. This partnership protects your data and eliminates risk — including DRII-Accepted Disaster Planning Principles, facility design and redundancy, fire detection, network and physical security and system monitoring. How frequently is my account data backed up? Your data will be backed up nightly, without interrupting your work, so that you don’t have to worry about losing any of your work or information due to power outages, network issues, etc. Why do I have to verify my identity when signing up? As a security measure, we require that users complete an identity check, powered by Experian. This process is not a credit check, but rather allows Circulus to verify your identity based on the Experian database, in an effort to prevent others from using your identity to process payments under your name. How often do I have to complete my identity verification? You will only be asked to verify your identity once, upon the initial account setup of Circulus. Subsequent bank accounts can be setup without identity verification via Experian. To confirm valid access to all registered bank accounts, the user will still need to verify and confirm the micro-transactions that are processed by their banking institution. For more info on the bank verification process, click here. How many bank accounts can I have on file? You may add up to 10 bank accounts for each of the companies within your account. For each separate bank account, you will need to verify and confirm the test transactions that appear in the account within one business day. How is my payment bank verified? Once your Circulus account has been approved, we send 3 micro test transactions (2 debits and an offsetting credit). These usually appear the next day in your bank feed. You will see an item in your To Do List once these have been posted. You simply click the item in your To Do List and provide the amount of the transactions. This will activate your bank account and then are ready to make payments. How are my bill payments processed? We are partnered with one of the largest and most established banks in the United States in order to process payments made via the Circulus portal. All accounts are FDIC insured, and we have implemented industry leading services to monitor web security, privacy, PCI compliance and SOC 1 Type II Attestation. How long will it take for payments to clear? ACH payments will be deposited into a payee’s bank account within 2-3 business days, and check payments are typically delivered within 3-5 business days. 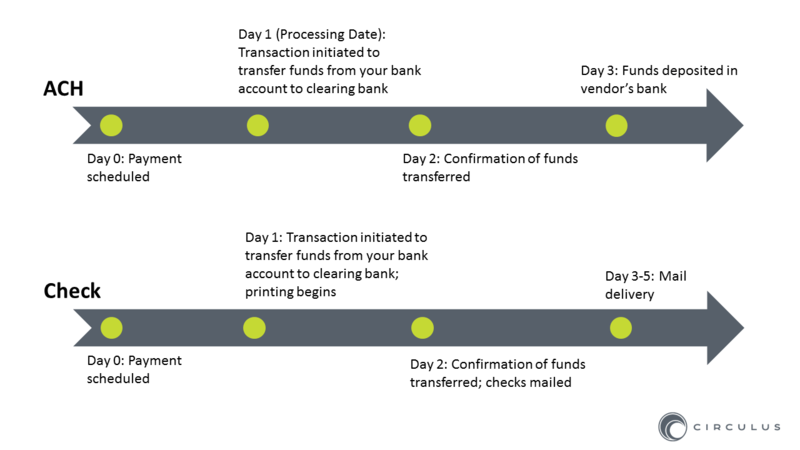 Automated Clearing House (ACH) payments provide the ability to transfer amounts between bank accounts electronically. These payments are commonly used for online bill payment and are an efficient and cost-effective way to process bill payments. What does a deposited ACH payment look like in a Payee’s bank account? Does Circulus allow me to pay my vendors/payees with physical checks? When using Circulus to pay via check, a physical check is printed through our partners at FIS (formerly SunGard) and mailed to your vendors/payees and will include your company name, the vendor’s/payee’s name and address on file along with all additional pertinent payment information. All checks include a remittance slip which lists the corresponding bills that were paid with the check. If I pay with a check, do I have the option to print or download generated checks? Checks generated through Circulus will be provided via a watermarked image that may be downloaded after the check(s) have been successfully deposited. Circulus also allows you the ability to print checks directly from your QuickBooks account by selecting the QuickBooks Check payment option. Do bills paid through QuickBooks sync to Circulus? Is there an option to mark a bill as paid? If you are paying a bill by printing a check through your QuickBooks account, Circulus provides you with a payment option of QuickBooks Check when making payments. This option will sync the corresponding payment information and create a check to be printed in your QuickBooks account. If you are paying a bill via Credit Card, or through any other method outside of Circulus, you will see a “Marked as Paid” option when making payments. What do check payments made via Circulus look like? How are the process date and estimated delivery dates derived? Under the General Settings section of your company settings (Admin > Company Settings), payment lead time for unpaid bills can be established for the pre-selected process date (the date the funds are pulled from your company bank account on file) when paying bills. The delivery date of a payment is the process date, plus the time for delivery of selected payment method (ACH or check). It takes approximately 2-3 days for delivery of ACH payments and 3-5 days for delivery of a check. How do I add a bill/expense in Circulus? How do I add/change a bill/expense image in Circulus? Search for the document under either Bills > Search Bills or Expenses > Search Expenses to find and locate the document for which you wish to add an image. Select the document number in blue and select the Browse option underneath the document details. How do I pay a bill/expense? Can I pay bills from the Circulus mobile app? Yes! The Circulus mobile app is very easy to use and allows you to upload, approve, and pay bills right from your iPhone or Android device. How do you delete and/ or restore a bill? To delete a bill, you can find specific bill number by going to Bills > Search Bills. In the populated list, select the bill(s) you want to delete and go to the far right of the table to select Delete from the action drop-down menu. This action will remove the bill from the workflow entirely. To restore a bill, go to the listing of bills and under Bills > Search Bills and select the Bill #. Once on the bill details page, scroll to the bottom and click Restore. How do I apply a vendor credit to a bill? Any bill that has a credit or discounted/returned amount is handled as a vendor credit. Adding a Vendor Credit follows the same process as adding a bill. How do I cancel or void a payment? To cancel a payment that is not yet in progress, navigate to Payments > Scheduled Payments and select the corresponding payment(s) you wish to cancel. Scroll to the bottom of the page to select the Cancel button. The bill(s) related to any canceled payment will automatically be moved to the Pay Bills section of your account. Refund – This option will void the payment and return the funds to the original bank account from which you paid the bill(s), and move the bill(s) back to the Pay Bills page. Void and re-issue via ACH– This option will void the current payment in progress, and re-issue it to the default bank account (Need to link to another article in the support portal for this) on file for this Vendor. Void and re-issue via Check – This option will void the current payment in progress, and re-issue it to the Vendor in the form of a check with the corresponding address on file for this Vendor. Is there a cost associated when I void a payment? Should you elect to void a payment, the transaction will still appear on your account statement at the end of your billing period. (i.e. : if you void an ACH payment, you will still be charged for that ACH transaction at $0.45) However, you will not be charged an additional fee to actually void the transaction. Can I combine vendor payments? Upon syncing your QuickBooks account, all vendors are defaulted to receive combined bill payments. To toggle this option, go to Vendors > Search Vendors, click on the vendor name and locate the check box for Combine Payments under the vendor’s Account Information. As a security measure, your account will be locked after 3 unsuccessful login attempts, at which point you will be prompted to reset your account password. On the Circulus Login page, simply click the “Forgot Password” link. After entering and submitting your email address, you will receive an email prompting you how to reset your password. What if the link in my password confirmation email does not work? Please send an email to smbsupport@circulus.io or call customer support at 1.844.982.4557. How do I add, deactivate and reactivate vendors? How do I add a Payee bank account? My payee has multiple bank accounts on file, how do I switch the account to which I am paying? To adjust the active payee bank account you wish to pay, simply navigate to the payee’s details and view the bank account details for the payee in question. From here, you will have the option to switch the default bank account receiving payment from the Actions drop-down menu. What is Circulus data entry services? Circulus data entry services eliminate having to complete data entry from your end. Send your bill image in by either uploading the image of the bill on the Add Bills page, or by sending an attached bill image to your bill inbox email address when the checkbox for Enable Circulus data entry option for your company under Admin > Company Settings is checked. Where do I submit a bill for data entry services? Send your bill image in by either uploading the image of the bill on the Add Bills page, or by sending an attached bill image to your bill inbox email address when the checkbox for Enable Circulus data entry option for your company under Admin > Company Settings is checked. How am I billed for data entry service? Each bill you send to us for data entry services is $0.99/bill and will appear on your next invoice. If you elect to have multiple line items entered, the fee is $99 per five, round up to the nearest five. How do I adjust the data entry services settings? To adjust the settings in place for data entry services, navigate to Admin > Company Settings and scroll down to the bottom of the page labeled Data Entry Settings. Where do I find a bill once Circulus has entered the data? Depending on your bill workflow, your bill is routed to either the Review, Approve or Pay section of your Circulus account. To double check what workflow you have selected, navigate to Admin > Company Settings. Will I be charged for data entry services if Circulus can’t read all or part of the bill? If information is missing from a bill or Circulus is unable to complete data entry services on a bill, it will be routed to Bills > Enter Bill Data as an exception. You will not be charged for the data entry attempt. One of our customer success experts may reach out to you in order to gather more details regarding the bill so that future bills with similar data may be entered by our team in the future. Do I need QuickBooks to use Circulus? At this time, an active QuickBooks Online or Desktop account is required to utilize the full bill payment capabilities of Circulus. Which versions of QuickBooks Online does Circulus Support? To view potential sync limitations, please click here. How do I manually sync my QuickBooks Online account with my Circulus account? To perform a quick, manual sync between your QuickBooks and Circulus accounts, navigate to Admin > Sync History and select the Sync Now button at the top of the page. Which versions of QuickBooks Desktop does Circulus Support? I am a QuickBooks Desktop user, how do I link my Circulus and QuickBooks account? Please feel free to contact us directly at 1.844.4557 and one of our customer success agents would be more than happy to walk you through the setup process. If you are more of a DIY person, follow the on-screen instructions and use this instruction supplement to setup up your QuickBooks Desktop and Circulus connection.